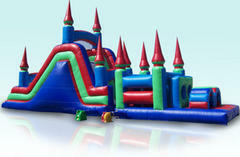 18 foot obstacle course great for all events and all ages. t measures 25ft long x 13ft wide x 15ft height. 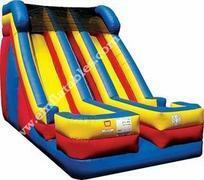 This dual lane slide is great for all events. Two different people can slide down at the same time on a separate slide. Each slide has a bumper at the end of the slide so that people do not land on the ground. They can exit the sides. A great addition to any party! 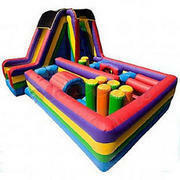 This awesome 48 foot slide with an obstacle course. 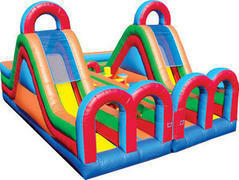 Castle, Obstacle and Slide Combination. 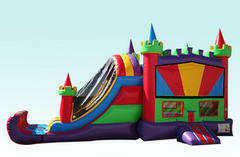 Large Castle with long obstacle course combo. 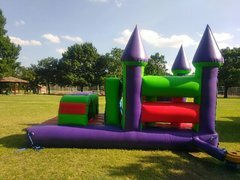 The actual unit has an underlying purple base and there are no cones on the obstacle course. 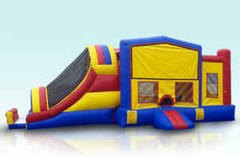 This 70ft Backyard Obstacle Course Fun House measures: 18' (L) x 15' (W) x 16' (H), this unit will fit almost anywhere! 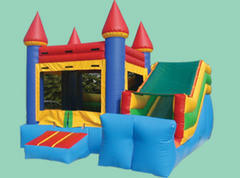 The actual 70ft Backyard obstacle course Fun House that we carry does not have the castle cones on top. 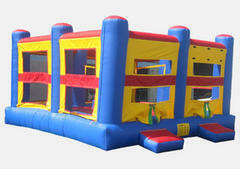 It is loaded with 9 different obstacles to navigate through, including a 6 foot obstacle tunnel. The tunnel passes right through the center of the Slide to the other side. There you will find 3 more challenging obstacles to go through before you enter the ladder climb which leads you to the top of our 16' slide. From the top of the slide, you're guaranteed a thrilling ride down to the bottom. The 70ft are counted as a maze that you circle around. Get a great deal on this 5 in 1 combo with a snow cone machine. Measures 25ft wide by 15ft long. 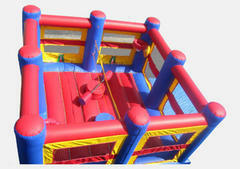 This boxing ring measure 18ft wide x 18ft long x 11ft height. Comes with 2 sets of jumbo gloves and 2 headgear masks. 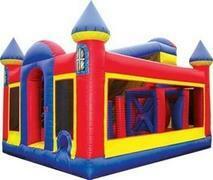 This bounce house measure 17ft wide by 17ft long and 16ft tall. 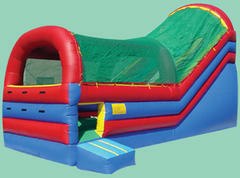 It has a jumping area with obstacle tubes. You cross over in the side where you can climb up and slide back down. 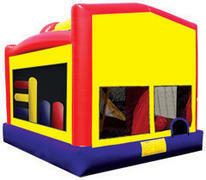 Great looking Hummer bounce house combo. Kids can come in through the back and exit through the front. It measures 15ft wide x 13ft wide x 8 ftt height. 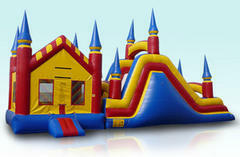 This is an indoor toddler playland that is very unique and special for your next event. Get something different than what everyone else is renting! 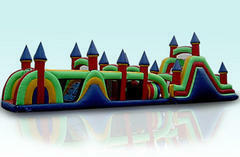 10ft wide x 17ft long and 9ft height. Setup area: 16ft wide x 14ft length x 10.5 ft height. 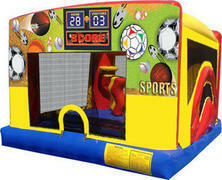 This indoor bounce house combo is great for indoor events. 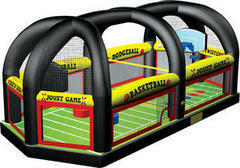 This combo contains a bouncing area, basket ball hoop, obstacle tubes and a small slide. The Sports banner can be removed. Measurements: Length: 14'6 x Width: 13'3" x Height: 9'10". 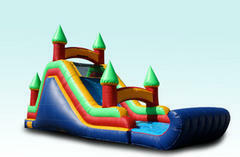 This joust ring measure 18ft wide x 18ft long x 11ft height. Comes with 2 sets of joust cushion poles and 2 headgear protectors. A very unique mushroom combination bouce house with an obstacle course, ramp and slide! Kids will love this unit! 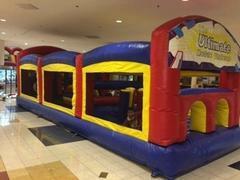 Measures 24ft long x 16ft wide x 12ft highest point. This ride is jam packed with obstacles to provide for optimum fun and excitement. Participants enter at the side of the Obstacle Course 360 and are immediately greeted with a wall obstacle. Clearing this leads to a crawl through tunnel and back up into pop-up obstacles. After pushing through this corner, the participant has to get creative to avoid getting entangled in the hurdles and trapped behind the ensuing wall. 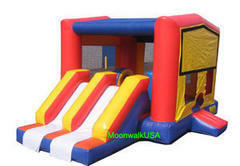 Once successfully through this challenging turn, sidestepping a few more pop-ups will lead the challenger to the steep 8 foot wall climb and slide down. Not so fast though, because there are two more pop ups to squeeze past at the end of the slide to come full circle and complete the Obstacle Course 360 challenge. 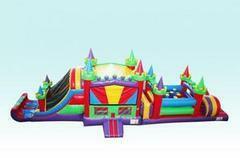 43 foot long inflatable bounce house. 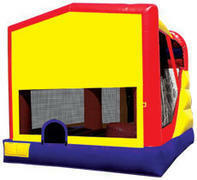 It consists of a bounce house with a basketball hoop, a slide and an 18ft obstacle course. 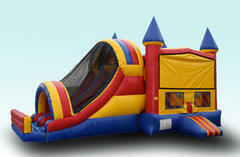 It measures 29ft Length x 19ft Wide x 16ft Height. 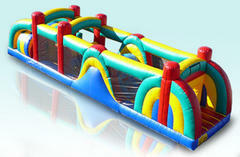 The Turbo Rush Obstacle Course is a twin obstacle course with slides. This item is great for entertaining a large group.